Multimedia presentations are applicable in various domains such as advertising, commercial presentations or education. 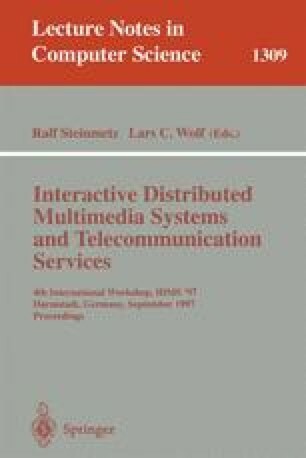 If multimedia documents which describe multimedia presentations can be accessed on-line via different network types and be presented on various types of terminals different amounts of resources may be available at presentation time. Hence, it can happen that there are not enough resources to render a multimedia document according to the specification. For usual multimedia documents resource scarcity implies an arbitrary reduced presentation quality. To handle resource scarcity in a better way, multimedia documents can be made adaptable to different resource situations. The presented temporal model provides abstractions to specify multimedia documents with alternative presentation parts. Further on, the presentation behavior of media objects can vary within specified limits. Hence, the presented temporal model allows to compose presentations which have a defined behavior when resource restrictions occur and a resource scarcity need not result in an arbitrary reduced presentation quality.